There is a genuine interest in the cloud and networking industries to come up with a common information model that can be used across a variety of management and orchestration technologies. Unfortunately, discussions about unifying information models tend to get tend to get stuck because of a reluctance to deviate too much from legacy designs, because of different modeling philosophies used by different Standards Development Organizations (SDOs), or by disagreements on how best to represent domain-specific features. As a result, these harmonization efforts are not moving nearly as fast as anyone would like. To move the discussions along, I would suggest that it might be helpful to focus first on a set of common modeling patterns that should be used by all information models, and then introduce domain specific models and features within the context of those core patterns. Leveraging the same core set of modeling patterns would allow us to build a generic set of orchestration and management tools that can process various models in a similar way. While this wouldn’t immediately lead to unified models, it would result in unified modeling abstractions on top of which existing models can get refactored. If domain-specific models are expressed using the same core modeling abstractions, we’re bound to more easily find commonalities between these models, and common tooling will likely also make it easier to extract those common features from domain-specific models. Of course, this begs the question of what common set of modeling patterns should be used. This is where I believe TOSCA can help tremendously. The TOSCA object model is sufficiently generic that it can be used across a wide variety of modeling domains. At the same time, it enforces a small number of very powerful abstractions that could provide the modeling foundation we just talked about. Unfortunately, the TOSCA modeling abstractions are not widely understood. While TOSCA is designed for model-driven orchestration, the TOSCA specification focuses almost exclusively on the grammar of the language, and the object model for TOSCA service models is only implicitly defined in the language, rather than being explicitly spelled out. This write-up is an attempt at more clearly articulating the TOSCA object model. 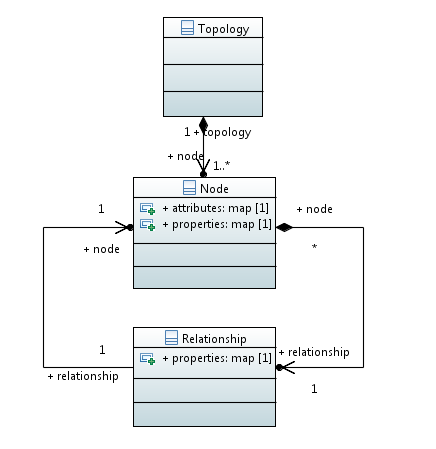 A TOSCA service is modeled as a topology graph that consists of a set of nodes as well as the relationships between these nodes. Nodes are the vertices in a service graph, and relationships are the edges in the graph. TOSCA nodes are intentionally as generic as possible. Nodes are essentially nothing more than a collection of named properties and their associated values. Nodes are named, and are labeled using a node type (more on that later). Relationships are first-class entities in a TOSCA graph. Just like nodes, relationships have properties, a label, and a name. The following figure shows a skeleton diagram of the basic TOSCA graph elements. As you can see, using graphs as the basic modeling construct makes TOSCA completely domain-independent. Any domain-specific meaning of nodes and relationships is introduced using the type field in nodes and relationships. TOSCA types provide specifications that constrain the types of properties (and their values) that can be associated with specific nodes and relationships. The use of graphs as the fundamental modeling construct combined with types as the specification mechanism makes TOSCA a flexible, general-purpose foundation for modeling a wide variety of application domains. The atomic/composite pattern. Using this pattern, systems are modeled as a collection of components, where each component is explicitly defined to be either atomic or composite. Composite components can in turn be composed of other components, which can again be either atomic or composite. Using this pattern, systems can be decomposed into an arbitrary number of levels, and components must be explicitly defined to be composite or atomic at design time. The component pattern: Using this pattern, systems are also modeled as a collection of components as before. However, the model does not try to further specify whether components are atomic or composite and components themselves do not further model their internal composition. If it is necessary to describe the internals of a specific component, then that component must be modeled as a separate system that is itself composed of other components, and a decomposition relationship must be established between the component and the system that describes its internals. The industry is converging on the component pattern as the only pattern that is flexible enough to accommodate a wide variety of composition scenarios. This is based on the key observation that whether a component is atomic or composite is not an intrinsic characteristic of that component. Instead, it is just an artifact of where the modeler stopped decomposing (if you think about it, even atoms are not atomic). All TOSCA services are modeled as a topology that consists of a set of nodes. A node in one TOSCA topology can be substituted by an entirely different topology with its own set of nodes. The substituting topology models the internals of the node it substitutes. 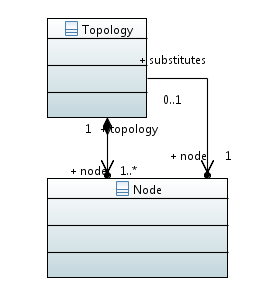 TOSCA maintains a substitutes relationship between the substituting service topology and the substituted node. Models are used to represent the run-time state of a system and can be used for operational management of that system. They can be used as intent models that represent the desired outcome of a (model-driven) orchestration process. Models can be used at design time to create reusable service components. However, TOSCA also includes a type system that can be used by service designers to create a set of reusable components from which service designers can construct service models. As a result, TOSCA is also a powerful design-time tool. More recent work on TOSCA includes a representation of the instance model, which provides a dynamic representation of the run-time state of services and their component that were orchestrated using TOSCA models. 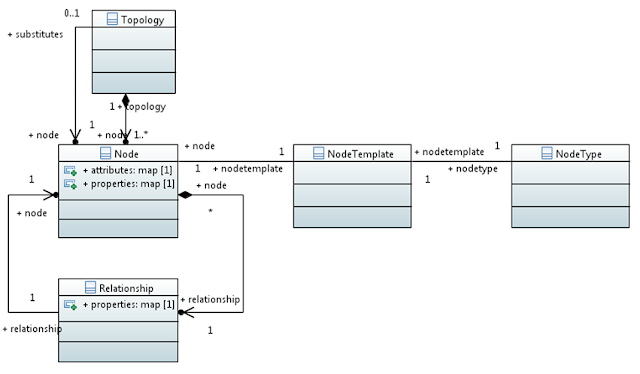 Node templates keep a reference to the node type that defines the schema for the properties in the node. Node types provide the specifications that turn generic nodes into reusable domain-specific components. If we assumed a modeling foundation based on these TOSCA patterns, then creating a unified information model becomes a challenge of harmonizing type systems, which is something that could get done gradually over time. Declarative orchestrators can either be model-driven or policy-based. Both focus on the WHAT rather than the HOW, but model-driven orchestrators focus on service topologies whereas policy-based orchestrators focus on service outcomes and behaviors. We’ve had the notion for a while that policies can be expressed at different levels of abstraction in a policy continuum. Declarative policies expressed in terms of business goals are referred to as intent statements. Intent engines realize services by mapping intent statements into configuration parameters of deployable software components and the resources on which these components are deployed. We have come to the realization that it is also possible to model services at different levels of abstraction in a model continuum. Model-driven orchestrators can realize abstract service models by translating them into deployment descriptors that define a low-level service topologies at the device/resource level. This summary leads to a couple of important observations. First, there appears to be a natural synergy between model-driven and policy-based approaches. Recall that declarative policies are expressed as constraints on capabilities within a given context (the context-capabilities-constraints pattern). But how does one specify context, and what is the mechanism for identifying capabilities within that context? Well, it seems obvious that at a specific level of abstraction, one could define a service model that serves as context for a declarative policy at that same level of abstraction. Observable (and controllable) parameters of that model could then represent capabilities, and policy expressions would specify constraints for those capabilities within the service model context. This suggests that abstract service models and declarative policies must go hand-in-hand in order to fully specify requested service behaviors at a given level of abstraction. I propose to use the term intent model to represent the combination of an abstract service model with a declarative policy that specifies desired outcomes for the modeled service. A second observation should be clear from the first one: the intent model pattern can be used at all levels of abstraction. At each level of abstraction, one could define an abstract service model that represents the service at that level of abstraction, and that service model could then serve as the context for the corresponding declarative policies at that same level of abstraction. This means we shouldn’t just think about a policy continuum or a model continuum, but rather about an intent model continuum that combines the two. Mapping constraints on capabilities of a higher-level service model into equivalent constraints on capabilities of the lower-level service model. This now gives us a much better handle on the problem, since we can borrow from readily-available constructs in software engineering. Software architects are very familiar with the type of model mapping we just described, since they perform such mappings as a matter of course in the context of top-down software design. Proper software design starts with high-level abstractions that are then decomposed recursively into increasingly lower level concepts. Recursive decomposition is a key design pattern that is supported by many software frameworks and architectures. The ETSI NFV architecture positions VNFs as abstract entities that need to be decomposed into sub topologies of VDUs. The ONFs most recent Information Modeling work introduces a component pattern that models most entities in the networking domain as components that can be decomposed into topologies of other components. TOSCA has built-in language support for recursive decomposition using a feature called substitution mappings, which allows any node in a service topology to be ‘substituted’ with an entire service topology consisting of other nodes. It seems natural, then, to use recursive decomposition as the primary construct for mapping abstract service models into lower levels of abstraction. Once service model mappings have been established, the problem of constraint mapping becomes a whole lot simpler. We are already used to ‘rolling-up’ low-level metrics into higher-level summary metrics, and constraint mapping is nothing more than the inverse of this ‘rolling-up’ activity. I have described previously a number of quality metrics for real-time communications that can be associated with service models at different levels of abstraction. We could go through similar exercises for other uses cases, and in fact this could result in (reusable) constraint mapping functions that can become part of a ‘toolbox’ for intent mapping engines. I hope to see recursive decomposition of intent models be adopted as a framework to accelerate development of general-purpose intent engines. From the classification introduced earlier, we know that model-driven and policy-based orchestrators both fall in the category of declarative orchestrators. Model-driven approaches describe services to be orchestrated using service models that represent service topologies, whereas policy-based approaches describe the services to be orchestrated in terms of expected service behaviors and/or outcomes. Policy-based orchestrators tend to provide simpler interfaces than model-driven orchestrators, since they expect less detail from service designers. Whereas model-driven approaches expect entire service models, policy-based approaches expect declarative policies that express constraints on observable parameters (“capabilities”) of the deployed service (the “context”). Context, capabilities, and constraints are all that is needed for declarative policies. Policy-based orchestrators appear to have the added advantage that (declarative) policies can be expressed at various levels of abstraction in a policy continuum. This leads to the concept of intent, which refers to declarative policies expressed in terms of business goals. However, we should ask ourselves if that advantage really only applies to policies, or whether model-driven orchestration can benefit from abstraction as well? The answer is obviously yes, since abstraction is at the core of almost everything we do in software engineering. In fact, a model is in essence nothing more than an abstract representation of the actual entity that is being modeled. If models are (almost by definition) abstract, then clearly we should be able to create different types of models depending on the level of abstraction at which we’re trying to model. Allowing users to model services at a high level of abstraction would simplify the task of the service designer, similar to how intent engines simplify the challenge of creating declarative policies. Granted, most model-driven orchestration systems today don’t fully support these levels of abstraction. They expect users to provide service templates that sit at the device view level and can best be described as deployment descriptors: low-level representations of the actual software components to be deployed, coupled with the resource configurations that are required to host those software components. But if intent engines can be expected to have the smarts to map high-level business goals into deployable services, wouldn’t it be reasonable to also expect model-driven orchestrators to be sophisticated enough to translate abstract service models into low-level deployment descriptors? I plan to explore later how such translation could be constructed. What Are Intent Engines Anyway? We discussed earlier that intent engines are a class of declarative orchestrators that allow customers to use policy expressions to specify the services to be orchestrated. This classification does a nice job of distinguishing intent engines from model-driven orchestrators, but is it sufficient to fully define intent engines? Specifically, can all policy-based orchestrators be classified as intent engines? Imperative policies expect policy expressions to specify actions that need to be taken by the policy engine in order to maintain compliance with the policy. Imperative policy statements are typically expressed using an Event-Condition-Action (ECA) pattern: if a certain event occurs, and the specified conditions are met, then take the following actions. Declarative policies, on the other hand, focus on expected outcome rather than on the actions required to achieve that outcome. Declarative policies are typically expressed using a Context-Capability-Constraint (CCC) pattern: within the specified context, make sure that capabilities exposed by the system comply with the given constraints at all times. Given that we have previously defined intent engines as a class of declarative orchestrator, it should come as no surprise that intent engines use declarative rather than imperative policies. As with other declarative systems, declarative policies are simpler to construct while leaving the complexities of the ensuring compliance with the policy to the orchestrator. From the early ONF work on Intent NBIs (as described in their Intent Definition whitepaper), it is clear that the original goal of intent NBIs was to let customers express services using terminology that expresses business goals rather than technology details. This would imply that policies capturing intent should be expressed at the Business View level of abstraction. As specified in the ONF document, this presumes some type of mapping service that translates “intent” expressions into software-consumable constructs. This mapping is one of the primary functions that has to be performed by the intent engine. Based on this analysis, we now have a better definition for intent engines: intent engines are a class of declarative orchestrators that allow customers to specify desired services using declarative policies that express business goals. I’ll explore next how this definition can help guide us in the implementation of intent engines. Intent is increasingly being positioned as the appropriate paradigm for network and service orchestration, and for good reason since the intent paradigm significantly reduces complexity for service designers. Consumers of intent-based systems can use simple intent statements to express their expectations for the service, while leaving the details (and the associated complexity) of how to meet those expectations up to the service provider. In other words, intent focuses on the WHAT, not on the HOW. Systems that adopt an intent paradigm are typically referred to as intent engines. Intent engines are orchestrators that map simple intent expressions into the resource allocations and configuration parameters that are required to deliver on the intent. Imperative orchestrators focus on the HOW: users of imperative orchestrators are expected to tell the orchestrator exactly how to get services deployed by prescribing the exact set of actions the orchestrator needs to take. Traditional automation techniques (e.g. “infrastructure as code”) are an example of this approach. Declarative orchestrators focus on the WHAT: users of declarative orchestrators are expected to describe what it is that they’re trying to get deployed and leave it up to the orchestrator to use the appropriate mechanisms to get a service deployed that delivers “WHAT” is expected. In one interpretation, WHAT can refer to “what things look like”. This is the STRUCTURAL point of view. Declarative orchestrators that use a structural approach expect service designers to describe the service topology that contains the entities that make up the service and the relationships between those entities. On the other hand, WHAT can also refer to “what things are supposed to do”. This is the FUNCTIONAL point of view. Declarative orchestrators that use a functional approach expect service designers to describe expected behavior of a service or expected outcomes to be delivered by the service. Structure is typically described using service models—information models that describe a service as a set of components and their relationships. Declarative orchestrators that process service models can be referred to as model-driven orchestrators. Behavior is typically described using policies that describe observable parameters of the service and the constraints with which these parameters have to comply. Declarative orchestrators that process policies can be referred to as policy-based orchestrators. Using this classification, it should be clear then that intent engines fall in the functional category and are a type of policy-based system. While model-driven orchestrators and intent engines are both types of declarative orchestrators, they approach the problem from very different angles. One could ask then, which approach is best. Answering that question requires a bit more analysis about how to construct policies that can capture intent, but it is safe to say that intent-based systems present a higher-level of abstraction than model-driven systems and as a result should be simpler to use. That said, I believe there is a clear synergy between intent-based and model-driven systems, which I hope to explore in more detail next. In the networking world, YANG has become the de-facto data modeling standard. For cloud applications, TOSCA is getting all the buzz. NFV straddles both worlds and is getting pull from both the YANG and the TOSCA camps. One could ask then if we really need two languages? Shouldn’t we standardize on one, and if so, which one? While these may sound like fair questions, they assume that both languages serve the same purpose and therefore are interchangeable. However, if we take a closer look at both languages, it becomes clear fairly quickly that this is not the case. TOSCA and YANG are in fact quite different. In a nutshell, YANG is a data modeling language while TOSCA is a service automation language. YANG is in essence a replacement for SNMP MIBs. YANG models define the schema for configuration and state data of networking devices, and network management tools use the NETCONF protocol to manipulate these data. In the SDN world, YANG has been adopted as a general-purpose modeling language that can be used independent of NETCONF (for example, YANG defines the data models for the model-driven service abstraction layer (MD-SAL) in OpenDaylight) but it is still strictly a data modeling language: it defines data schema without associating any semantics with the data that are being modeled. TOSCA, on the other hand, was designed as an automation language for deploying and managing cloud services. Unlike many other automation tools, TOSCA uses a declarative approach that starts with a description of what needs to be deployed, rather than with a prescription of the steps that need to be taken for the deployment. In TOSCA, this description consists of a service model that contains the components that make up the service (TOSCA nodes) as well as the relationships between these components. It is this service modeling functionality that invites comparisons with YANG. TOSCA services and their components have life-cycle management interfaces that define operations for creating, configuring, deploying, and decommissioning services. TOSCA has built-in implementations for these operations for a number of “primitive” node and relationship types but service designers can provide their own implementations or create custom life-cycle interfaces. TOSCA implements a standard workflow for deploying services using the operations of standard life-cycle interfaces, but service designers can also create their own custom workflows. TOSCA allows service designers to specify policies with which their services have to comply. This policy support can be used to as a framework for enabling intent-based interfaces. TOSCA supports service templates that can be used as blueprints for instantiating new services. It is these service management features that make TOSCA a service automation language rather than just a modeling language. This doesn’t imply that TOSCA is better than YANG, just that it serves a different purpose. In fact, there is plenty of room for both standards and it makes perfect sense to use YANG in the context of TOSCA. For example, when providing implementations for life-cycle management operations for network nodes, TOSCA could translate node properties and attributes into the corresponding YANG configuration data that are then applied to the physical devices using NETCONF-based tools. I’d love to see these types of ideas implemented so we can start focusing on the synergies between TOSCA and YANG and benefit from both.